Ferris Bueller's Day Off is one of those movies that is just kind of synonymous with the 1980's, so it was only fitting that it got the Phantom Cardboard treatment. Has there ever been a more pull forable (not a word?) character than the depressive, hypochondriac Cameron Frye? 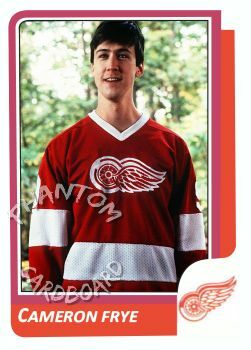 Cameron sporting Gordie Howe's winged wheel sweater in the movie made him perfect for a custom card. I was turned on about making this one because it's the only hockey card I've done, although I'd really get a kick out of making some cards from Slap Shot too. 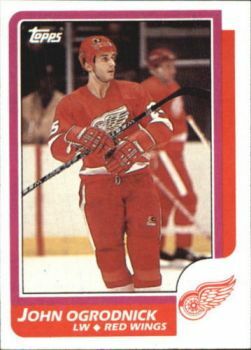 I chose the 1986 Topps hockey design, the year of Ferris Bueller's release. It all came together pretty well, in my opinion. I was able to recreate the design with no frustration which is always a bonus. Now I wait for a TTM success from Mr. Alan Ruck.